Royal Philips, founded in 1891 in the Netherlands is one of the largest electronics companies in the world, employing over 105,000 individuals in over 100 countries. It is a leading health technology company with a keen focus on improving people’s health. This spans from healthy living, to diagnosis, treatment, and home care. Philips puts strong emphasis on leveraging the latest in technology, design, and deep consumer insights when developing each of the products in its broad portfolio. The company is a leader in diagnostic imaging, image-guided therapy, patient monitoring and health informatics, as well as consumer health and home care. Jens Andersson joined Philips 3.5 years ago and is a Design Lead at Philips Design. Jens is primarily responsible for the industrial design of products in the Male Grooming department. 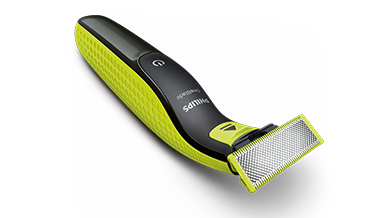 This consists of shavers, beard trimmers, hair clippers, and more. In his role, Jens also works with other teams to design products including health care, personal health, and CT scanners. Jens is not only responsible for working with marketing and engineering to bring new products to market, but is also, together with the team, tasked with coordinating the brand’s portfolio management and 5-year plan. ,br> A little over three years ago the team at Philips set out to find a new piece of software for their team that would work better than their current tools. The goal was to find one tool that could be used by all members of the team. This would help to create consistency, easy file transfer/handoff with design peers and engineering, and would increase overall team speed and efficiency. Jens was selected for the Evolve pilot program and set out on a 1-week training course with the tool. Shortly after the course and some one-on-one training, Jens utilized Evolve on a live project. 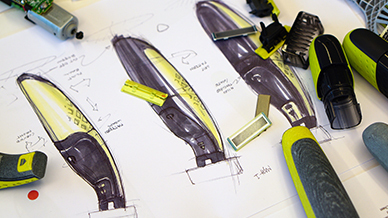 Quickly and easily visualize new product concepts with the goal of working hand-in-hand with design colleagues and engineering department to share feedback, understand challenges, and ultimately conceptualize final products. Concept development and visualization with Evolve to create multiple go-to-market products. Evolve is striking the perfect balance between a conceptual design software and a rigid engineering package. It has the power of construction history and surface control but also allowing conceptual modeling without being too inflexible. Jens has become extremely productive in Evolve, he has already used it on multiple products that are on the market including the Philips OneBlade, the Philips Health Watch, and the Philips Bodygroom series 1000. Jens noted, “Working in the collaboration-driven environment of Philips design demands tools that I can depend on to help deliver great products to market quickly. Evolve in particular is a powerful software for enabling designs in our fast-paced development environment. It helps me gain speed not only in bringing design concepts to life, but also in driving fast iteration loops with the development team. I especially appreciate the construction history as consumer product development can be a moving target as consumer insight and feasibility is constantly effecting the design. Evolve’s features allow us to intuitively adjust the design throughout the process, generating options and visualizing solutions quickly to keep the design intent intact. Evolve is striking the perfect balance between a conceptual design software and a rigid engineering package. 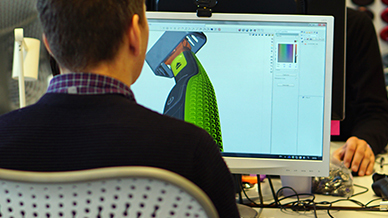 It has the power of construction history and surface control but also allowing conceptual modeling without being too inflexible.” Jens is planning to continue his usage of Evolve while also encouraging and teaching colleagues at Philips Design to learn the tool.